The brownie – arguably the most loved baked goodie around. I, at least, have encountered few people who don’t like this chocolate-y piece of heaven. There is this one friend of mine who said she didn’t like them — until she tasted my brownies, that is… So here’s the recipe for my favourite sweet treat: the chocolate brownie. I’ve made them with raspberries this time, but if you don’t like that you can just leave them out, or replace them with something else, such as hazelnuts or walnuts. – You’ll also need some kind of baking tin, mine is 20 x 24 cm. – And, of course, an oven. The brownies need to be baked at 150 °C. Don’t forget to preheat the oven! 1. Melt the chocolate The first thing you want to do is heat up some water. What for, you ask me? Well, we’re going to melt the chocolate using the “au bain marie” method. 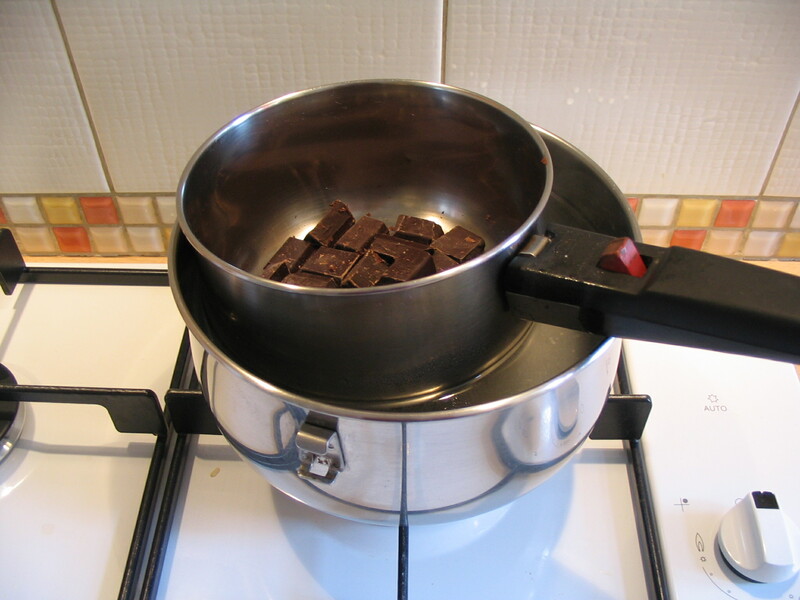 This means you put all of the chocolate in one pan (or bowl) and put that one in another, larger, pan (with the heated water in it) on the stove, like in the picture on the left (source: Wikipedia). Make sure no water gets into the pan with the chocolate, and also make sure the water doesn’t boil. If this seems like to much of a hassle, just melt the chocolate in the microwave. It’s a lot easier, but I just really like the “au bain marie” method. 2. Mix sugar and butter While the chocolate is melting the next order of business is to mix the sugar with the butter. A lot of cookbooks tell you to mix the butter while it’s on room temperature. However, I’ve experienced that the butter and (in this case) the sugar will just form one big ball of goo on your whisk, and that’s extremely annoying. That’s why I suggest you just melt the butter before mixing it, unless mentioned otherwise. 3. Add eggs So, now you’ve mixed the butter with the sugar it’s time to add the eggs one by one. I usually do this is as quickly as possible, because I detest the smell of butter. Haven’t eaten butter on my bread since I was very little, and the smell on its own nauseates me! 4. Add flour Once you’ve added the eggs and whisked them through your batter, you should add the flour to it, and mix the batter again. You’ll notice how everything starts to stick together and the batter gets a lot more texture. That’s because of the flour. 5. Add melted chocolate Now, it’s time to add the pièce de résistance; the melted chocolate! If your chocolate is not entirely melted yet at this point, just gently stir the chocolate, this will speed up the process. Then, once it’s melted, mix the chocolate with the rest of the batter. Don’t forget to turn of the stove! 6. Add raspberries Whisk everything together. Now, doesn’t that look delicious? Add the raspberries to the mixture and gently whisk them through. I suggest using a spoon now, instead of a whisk, so the raspberries don’t “break”. Once everything is mixed together your batter is done! 7. Butter and flour tin, pour in batter and bake Butter your baking tin, and then put flour on every surface of it as well. Once this is done, pour your batter into the tin and make sure it’s evenly spread out. Your oven should be preheated now, so put the tin in it, and set the timer to 25 minutes. Now it’s time to wait! Do you smell that delicious smell? I think those brownies are almost done! Once the 25 minutes have passed, check if the batter is properly baked by inserting a skewer into it. If it comes out dry, it’s done. If it comes out wet you should let it bake for a little while longer. However, brownies taste best if they’re still a little bit moist, so don’t let them bake too long either! Once they’re really done, take the tin out of the oven and let the brownies cool for a bit. Then cut them into squares (or whatever form you’d like). They taste delicious while they’re still warm! And that’s it! Easy peasy, isn’t it? 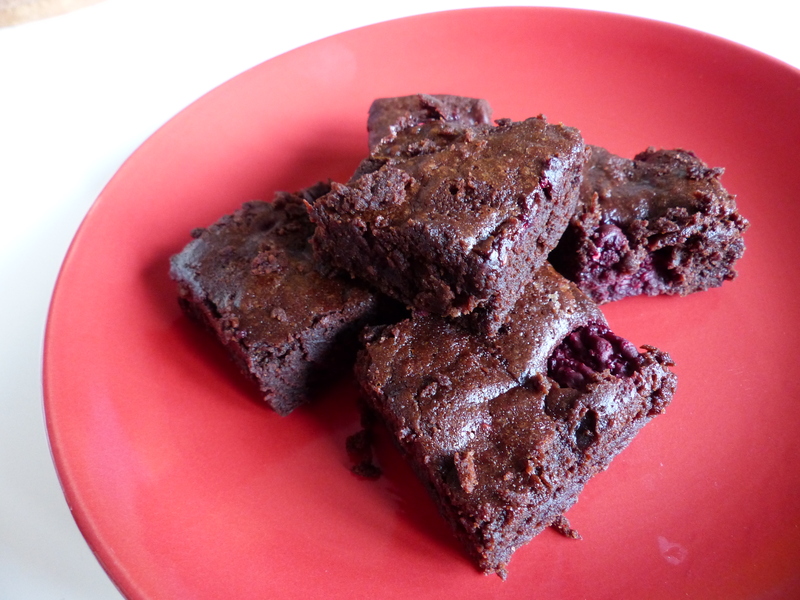 Let me know how your brownies tasted if you decide to make them, and if you’ve got another great recipe and think I’m doing it all wrong, let me know, too!